Pictured left to right are Mike Bracy, president of Chesapeake Music; Vernon Nily of the Ruth and Robert St. John Foundation; and Don Buxton, executive director of Chesapeake Music. Chesapeake Music recently received a grant from the Ruth and Robert St. John Foundation for the Chesapeake Chamber Music Festival (June 2016) and for the upcoming Chesapeake Chamber Music Competition, the biennial Competition is a competition for young professional chamber music ensembles which will be held on April 9, 2016. In addition to the Chesapeake Chamber Music Festival and Competition, Chesapeake Music sponsors The Monty Alexander Jazz Festival every Labor Day weekend and a Jazz on the Chesapeake concert series year round. Chesapeake Music’s YouthReach Program works with area schools to bring a greater exposure of classical and jazz music, reaching thousands of young students annually and its First Strings Program continues to inspire and excite 3rd and 4th graders in area schools by introducing them to the violin. Chesapeake Music is governed by an active Board of Directors and an army of 150 active volunteers. For further information about the organization’s offerings or to volunteer, contact Don Buxton at 410-819-0380 or visit chesapeakemusic.org. 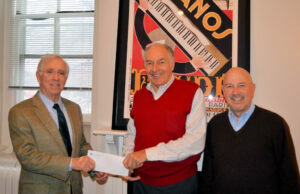 Caption: Pictured left to right are Mike Bracy, president of Chesapeake Music; Vernon Nily of the Ruth and Robert St. John Foundation; and Don Buxton, executive director of Chesapeake Music.